Streetcars are on the minds of many in St. Louis. The Loop Trolley finally got through the University City city council and will soon begin construction. Meanwhile, the Partnership for Downtown St. Louis unveiled their own streetcar proposal. Matt Fernandez already wrote a nice article on NextSTL, so I won’t repeat what he’s already said. In summary, the Partnership has proposed a system composed of 2 lines spanning 7 miles: one going from the Gateway Mall at 7th St to the Central West End via Olive, Lindell, and Taylor and a second line going from Civic Center to Old North St. Louis via 14th St and North Florissant. The proposed north-south streetcar line would duplicate portions of the Northside MetroLink line that was studied back in 2008. Given the general shorter range of streetcars, there has been some concern that the route duplication could impede the future expansion of MetroLink into north city and beyond. These concerns are not unfounded. 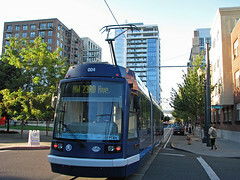 Back in 2001, Portland opened one of the first modern streetcar lines in the US to rave reviews. However, the streetcar line Portland built is largely incompatible with its larger MAX light-rail system as the following sentence from Wikipedia explains. While streetcars can operate on the MAX light-rail tracks, a MAX car would be too heavy to operate on the streetcar’s tracks, too wide for portions of its right-of-way, and unable to pass through the tighter curves on the Portland Streetcar system. Before outlining the issues at hand, let me first say that references to MetroLink below will usually refer to the low-floor streetcar-like version proposed in the Northside-Southside MetroLink study. The existing MetroLink lines are not compatible with streetcars in any way, shape, or form save for a quick trip to the Ewing train yard. So without further ado, below is a list of elements that could potentially differentiate streetcars from MetroLink along with how severely each issue may affect compatibility between the two systems. With the exceptions of New Orleans, Pennsylvania, or San Francisco public transit, 1435 mm is the near universal track gauge for all freight and passenger rail. MetroLink currently operates under 750-volt DC power, a fairly common standard amongst rail transit systems in the US. The only likely difference between MetroLink and the proposed streetcar is the type of overhead wire: tensioned catenary for MetroLink, trolley wire for the streetcar. MetroLink should be capable of running under trolley wire as long as it doesn’t speed too fast. MetroLink 2-car trains are approximately 180ft long. Streetcars in the US are typically 60 to 66ft in length, though some cities in Europe have streetcars as long as 175ft. A St. Louis streetcar is unlikely to be any longer than 90ft. A MetroLink train operating on streetcar tracks would be limited to a single car length barring significant platform expansion. MetroLink trains are capable of turning on curvatures with radii as small as 25 meters. However, thanks to their smaller profiles, many standard streetcar designs are capable of handling curves with radii of only 18 meters which allows them to fit into tighter, more crowded environments than typically allowed by light-rail vehicles. Both MetroLink and streetcars would utilize the same 14in platform height. In the US, streetcars stations have also been built with 10in platforms. The lower platform allows buses to interface with the stations, as well, since 14in platforms are a hair too high and block the doors on buses. Another consideration is that the higher 14-inch platform allows for fully level MetroLink-like boarding while 10-inch platforms require the use of a bridgeplate for ADA purposes. Use of a bridgeplate, naturally, slightly slows down the boarding process at each station it is used. For obvious reasons, streetcars won’t be able to use existing MetroLink platforms and the existing MetroLink won’t be able to use streetcar platforms. Theoretically, both streetcars and MetroLink would be able to use the same tracks, although in MetroLink’s case, there would be some awkwardness in South County where high and low platforms would be required at each station to accommodate high and low floor MetroLink vehicles should both a Southside and MetroSouth expansion occur. Streetcars in Europe generally come in 3 different widths: 2.3m, 2.4m, and 2.65m with some 2.46m systems scattered about. In the US, the general standard for light-rail vehicles such as MetroLink is 2.65m (8ft 8.5in). Thanks to Portland, the emerging US streetcar standard is 2.46m (8ft 1in) with some cities opting for the wider light-rail standard. Vehicle width will have the effect of “locking in” platform distances from the tracks. 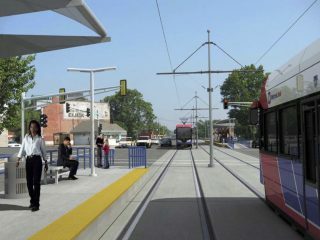 Platforms designed for narrower streetcar vehicles will impede wider light-rail trains, platforms designed for wider light-rail trains will prevent use of narrow streetcars. Also, wider vehicles will require a wider right-of-way or lane to comfortably mix with traffic. Streetcars have become popular in cities for one major reason: cost. Whereas new light-rail alignments often cost $50 million per mile at a minimum, streetcars can be built for less than $40 million per mile. Aside from doing away with many of the amenities offered on light-rail systems, streetcar vehicles are smaller and significantly lighter than their light-rail cousins allowing for cheaper, shallower trackbed construction. A major side effect of this cheaper construction, however, is that the trackbed can’t support the weight of heavier light-rail vehicles such as MetroLink. Compatibility with MetroLink would require stronger, deeper trackbeds which would potentially wipe out much of the cost savings of streetcars versus light-rail. There are many different elements that could differentiate streetcars from MetroLink and make them incompatible with each other, but that hasn’t stopped cities across the country from jumping on the streetcar bandwagon. All things considered, I support using a model similar to Portland for the reintroduction of streetcars to St. Louis.